Not a great deal of change this month. Work continues on expanding the housing on the Littlecombe site in Cam. The new terracing constructed on the opposite slope to the hospital now has a number of new houses being built on it and expansion is continuing along the valley. Elsewhere a new garden centre has opened on Dursley Road in Cam, on the same site as the previous one (Windways) closed down over 14 years ago. A fantastic orange sky greets those intrepid enough to make their way to the top of Stinchcombe Hill. A new garden centre has opened approximately 14 years after the previous one on the same site at Dursley Road, Cam, closed down. 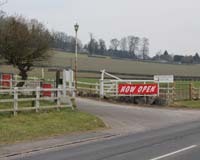 The sign for the new garden centre on Dursley Road, Cam. More new houses occupy the terracing on the north-east side of the old Lister factory site.